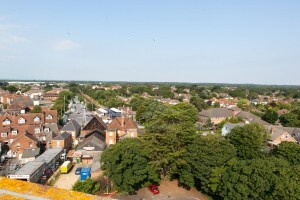 The water tower in New Milton is one of the very early buildings in New Milton. It is also the most recognisable landmark in our town. 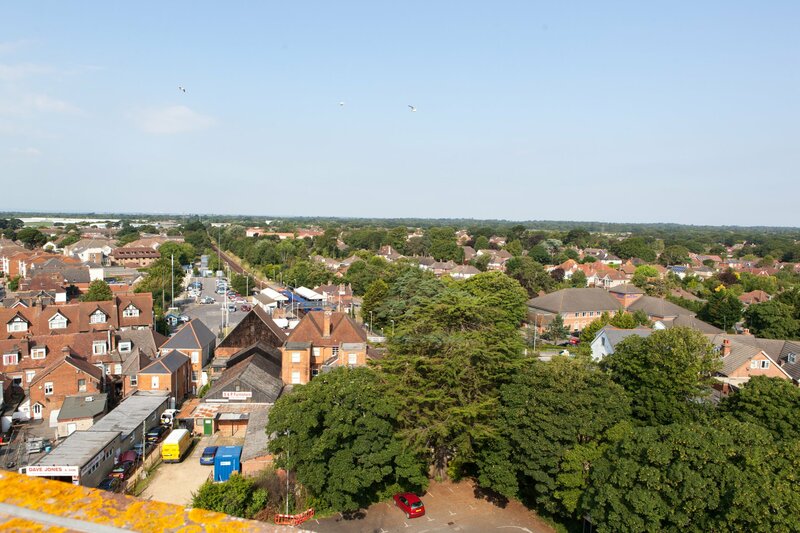 If you try to take a photograph in our town centre, you will nearly always end up with the water tower appearing in the background or on the skyline. In 1893 the West Hampshire Water Company came into being following the earlier West Hampshire Water act of Parliament. The company had a registered office in Christchurch. 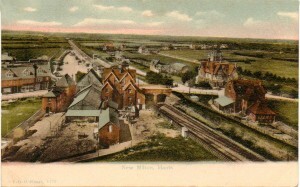 The West Hampshire Water Company, in 1889, purchased a plot of land in Osborne Road, New Milton from the Robb family. Work commenced on the construction of a three storey brick built mock Tudor design and the building was completed in 1900. 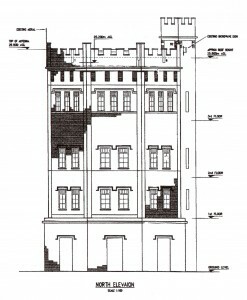 The tower stands 83’ 7” (25.5 meters) above ground level or 212 feet high from mean sea level. It holds 200,000 gallons of water. It should be noted that this is a higher than the other water reservoir tanks at Christchurch which are only 172 feet above mean sea level. In the early 1900s an intrepid photographer climbed to the top of the water tower and took this image of the town, looking west across the railway sidings. This photograph must have been taken after 1900 when the tower was built and before 1904 when the row of shops known as ‘Bank Terrace’ (now with Lloyds Bank on the corner) was built in 1904. In 2014 the author commissioned another intrepid photographer, Mark Gallagher, to climb the tower and take a comparison photograph, which is published here for the first time. In the Second World War there were attempts to camouflage if by wrapping green hessian cloth around it and hanging branches of evergreen fir trees from the castellation at the top. 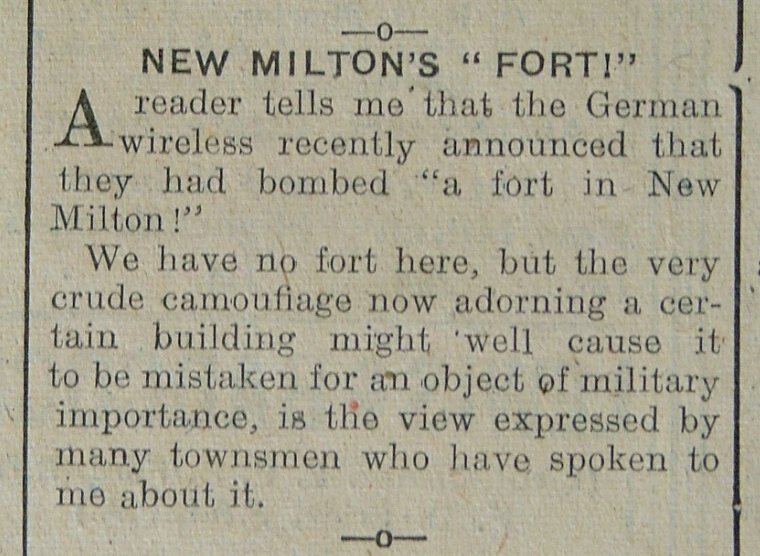 In fact, after the second bombing of New Milton on 8th of August 1942 when a bomb was dropped in nearby Spencer Road, sadly killing a Mrs Richardson, German radio announced that they had bombed “A Fort” in New Milton. This was reported in our local paper. 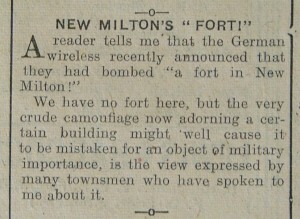 Townsman in the New Milton Advertiser and Time suggested that the crude camouflage on the tower may have led the Germans to believe this was a military target of significance. 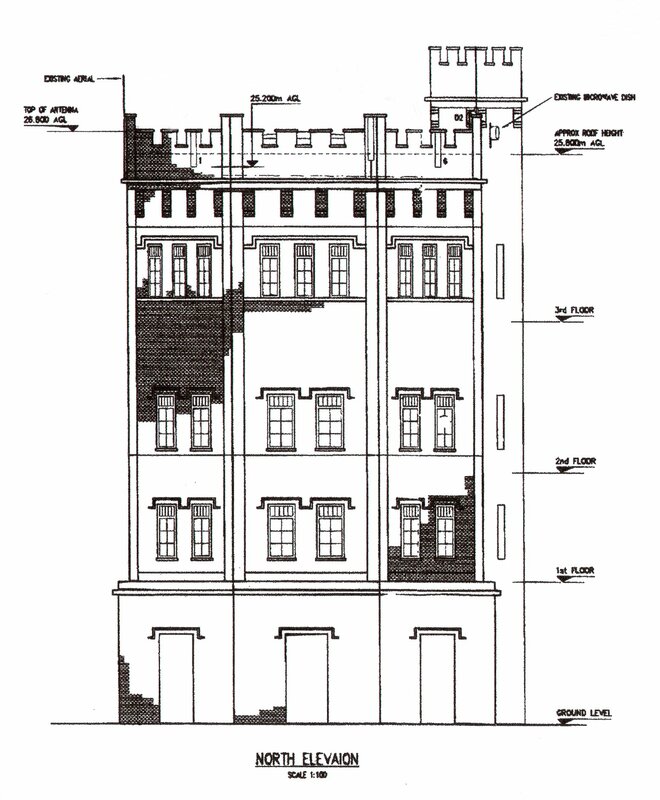 On 29th of October 1974 the Water Tower was listed as a building of special architectural or historic interest which does offer it protection from demolition or alterations which would alter its appearance or character. Our Water Tower continues to carry out its original function to this day.It is hoped that our water tower will continue to appear in the background of our photographs for many years to come. The author would like to thank the staff at Sembcorp Bournemouth Water for granting permission for Mark Gallagher to take photographs from the top of the tower and for providing research material used in this article. Thanks also to Mark Gallagher for his excellent photograph.